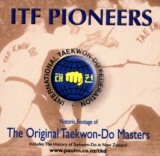 The quality is not great - but for the ITF enthusiast it is a priceless record of the early Pioneers Of Taekwon-do. Features Masters: Park Jong Soo, Choi Kwang Jo, Kong Young Il and others. Footage of the 1973 ITF Demonstration Team in Germany. Features Masters: Rhee Ki Ha, Kong Young Il, Park Jong Soo and Choi Chang Keun. Bag Work & Kicking Drills by Master Kong Young Il & his younger brother. Contains over 50 minutes of Digitized video in MPEG format.